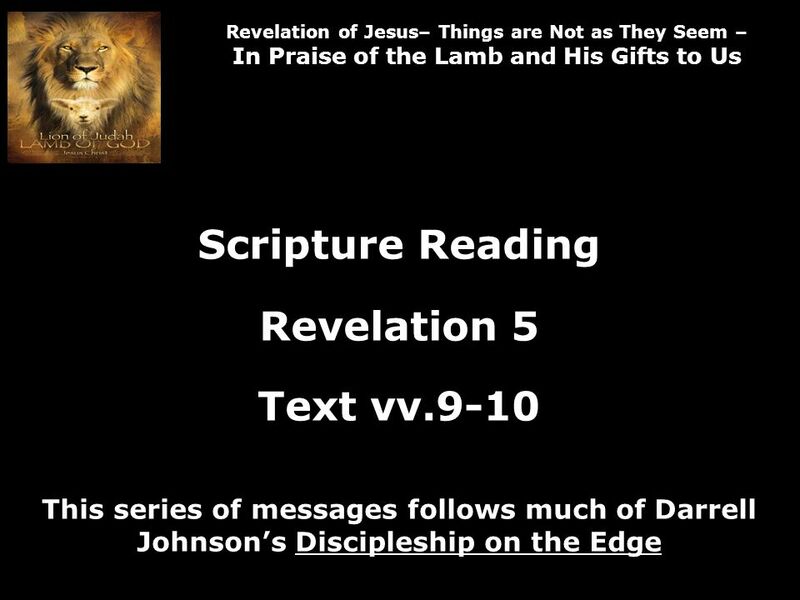 Revelation of Jesus– Things are Not as They Seem – In Praise of the Lamb and His Gifts to Us Scripture Reading Revelation 5 Text vv.9-10 This series of. 2 Revelation of Jesus– Things are Not as They Seem – In Praise of the Lamb and His Gifts to Us Do you sometimes get gifts that you are not sure what they can do for you? I once got a computer program in the mail from a cousin in Holland. I wasnt sure what it did. I did not explore what it could do for me. I never installed it on my computer. 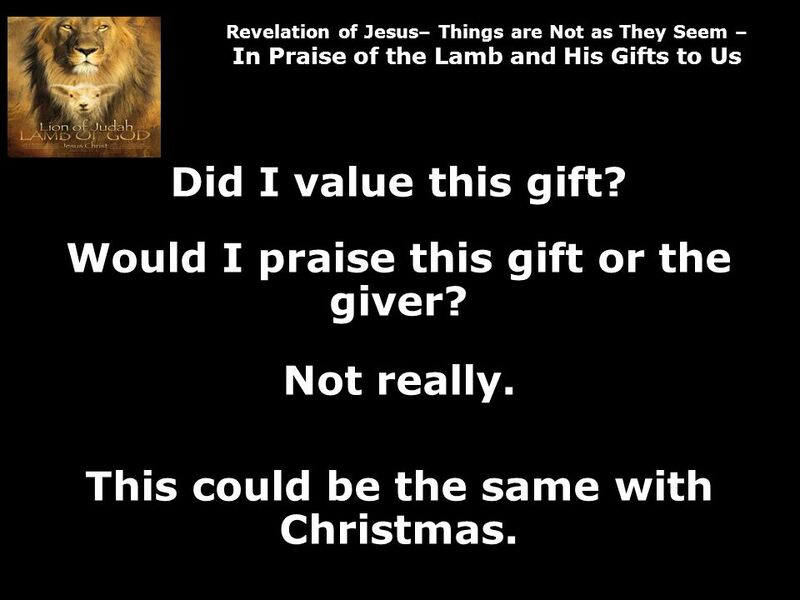 3 Revelation of Jesus– Things are Not as They Seem – In Praise of the Lamb and His Gifts to Us Did I value this gift? Would I praise this gift or the giver? Not really. This could be the same with Christmas. 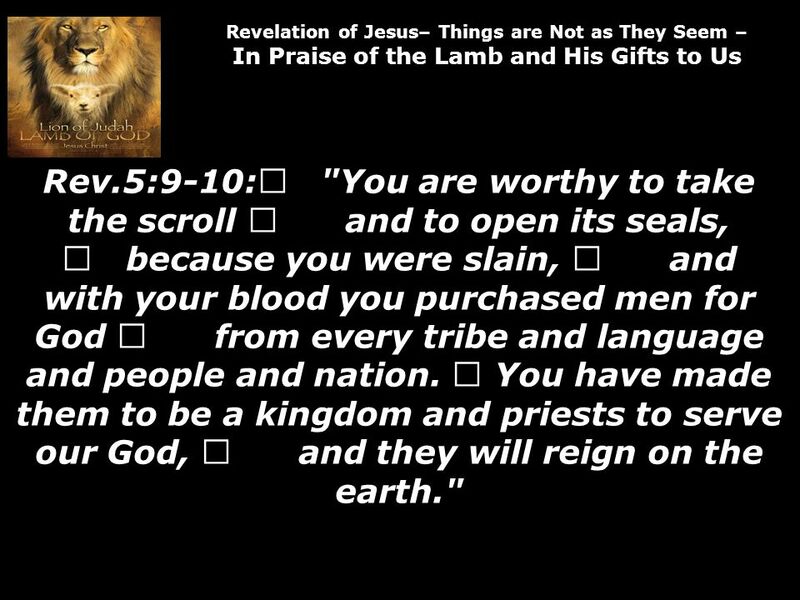 5 Revelation of Jesus– Things are Not as They Seem – In Praise of the Lamb and His Gifts to Us Rev.5:9-10: "You are worthy to take the scroll and to open its seals, because you were slain, and with your blood you purchased men for God from every tribe and language and people and nation. 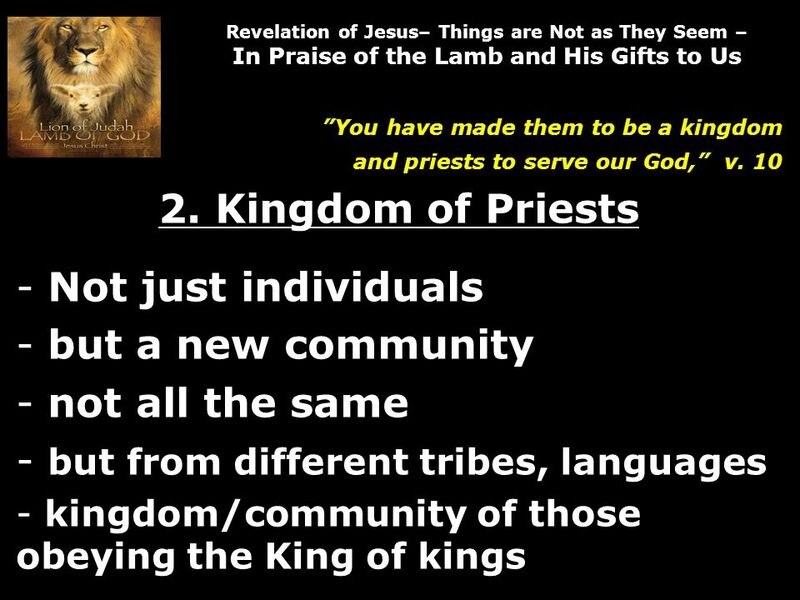 You have made them to be a kingdom and priests to serve our God, and they will reign on the earth." 6 Revelation of Jesus– Things are Not as They Seem – In Praise of the Lamb and His Gifts to Us "You are worthy to take the scroll and to open its seals, because you were slain, and with your blood you purchased men for God from every tribe and language and people and nation. 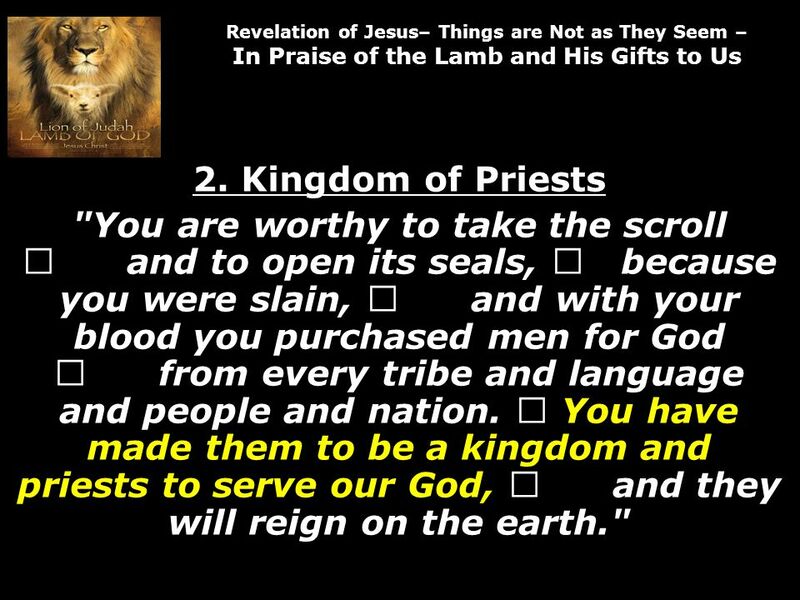 You have made them to be a kingdom and priests to serve our God, and they will reign on the earth. 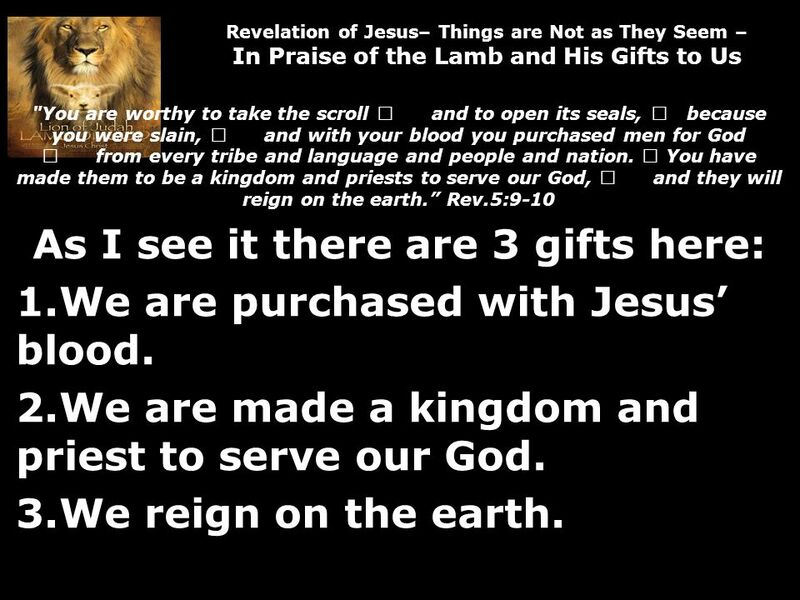 Rev.5:9-10 As I see it there are 3 gifts here: 1.We are purchased with Jesus blood. 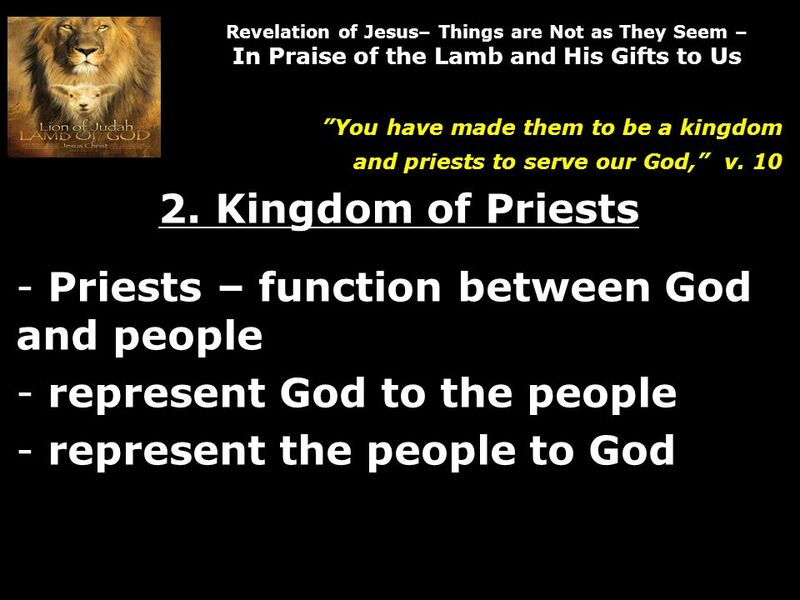 2.We are made a kingdom and priest to serve our God. 3.We reign on the earth. 9 Revelation of Jesus– Things are Not as They Seem – In Praise of the Lamb and His Gifts to Us Romans 6:17-18: But thanks be to God that, though you used to be slaves to sin, you wholeheartedly obeyed the form of teaching to which you were entrusted. You have been set free from sin and have become slaves to righteousness. 10 Revelation of Jesus– Things are Not as They Seem – In Praise of the Lamb and His Gifts to Us We are no longer slaves to the devil and sin! We have been bought with the blood of the Lamb! 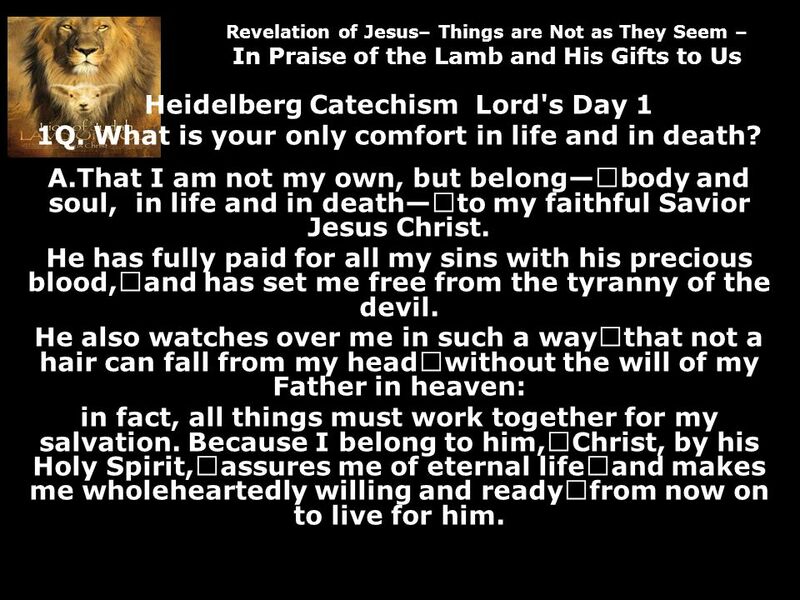 11 Revelation of Jesus– Things are Not as They Seem – In Praise of the Lamb and His Gifts to Us Heidelberg Catechism Lord's Day 1 1Q. What is your only comfort in life and in death? A.That I am not my own, but belong body and soul, in life and in death to my faithful Savior Jesus Christ. He has fully paid for all my sins with his precious blood, and has set me free from the tyranny of the devil. He also watches over me in such a way that not a hair can fall from my head without the will of my Father in heaven: in fact, all things must work together for my salvation. Because I belong to him, Christ, by his Holy Spirit, assures me of eternal life and makes me wholeheartedly willing and ready from now on to live for him. 12 Revelation of Jesus– Things are Not as They Seem – In Praise of the Lamb and His Gifts to Us This Christmas, join in the praise to Jesus, the slain Lamb on the throne by realizing that you have been bought out of slavery to sin and by utilizing that freedom to serve God. 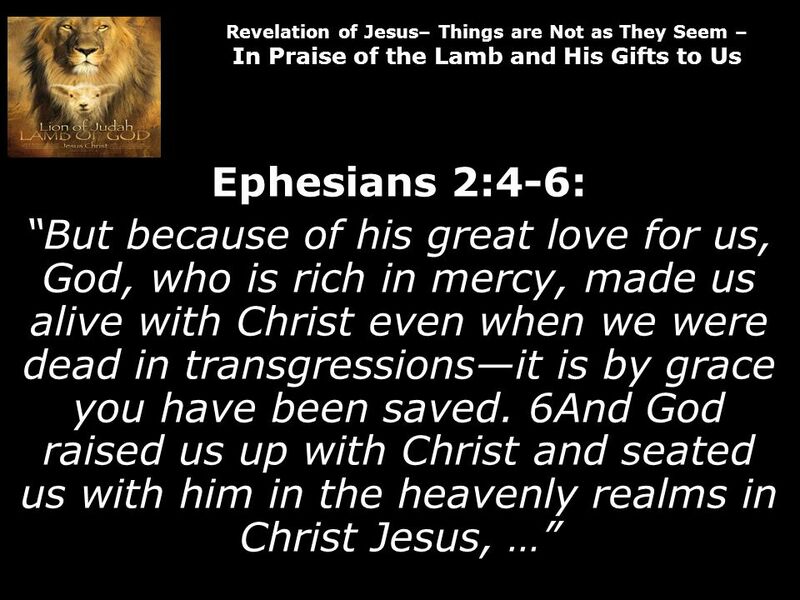 13 Revelation of Jesus– Things are Not as They Seem – In Praise of the Lamb and His Gifts to Us 2. Kingdom of Priests "You are worthy to take the scroll and to open its seals, because you were slain, and with your blood you purchased men for God from every tribe and language and people and nation. You have made them to be a kingdom and priests to serve our God, and they will reign on the earth." 15 Revelation of Jesus– Things are Not as They Seem – In Praise of the Lamb and His Gifts to Us You have made them to be a kingdom and priests to serve our God, v. 10 2. 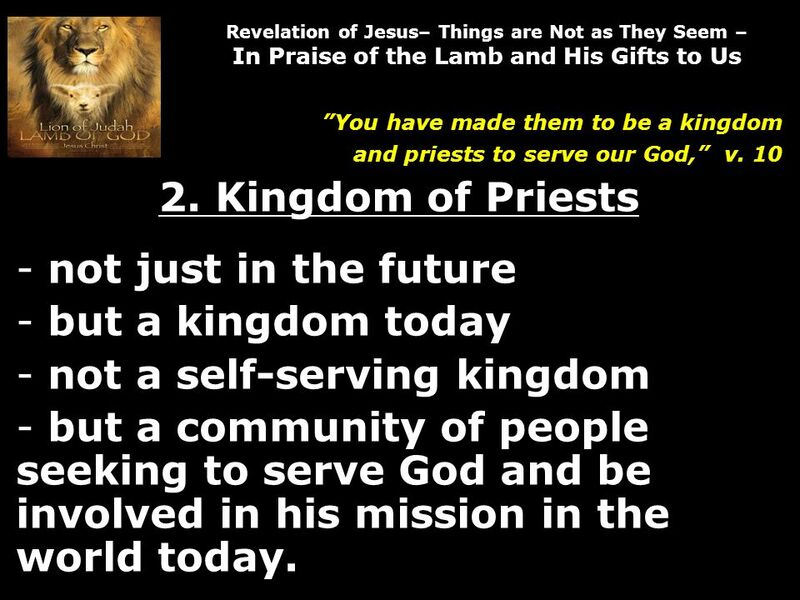 Kingdom of Priests - not just in the future - but a kingdom today - not a self-serving kingdom - but a community of people seeking to serve God and be involved in his mission in the world today. 17 Revelation of Jesus– Things are Not as They Seem – In Praise of the Lamb and His Gifts to Us You have made them to be a kingdom and priests to serve our God, v. 10 2. 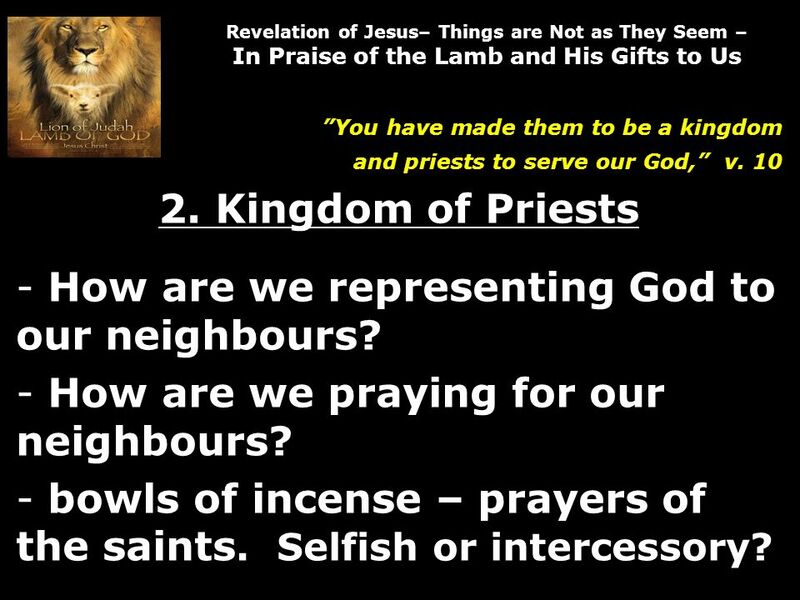 Kingdom of Priests - How are we representing God to our neighbours? - How are we praying for our neighbours? - bowls of incense – prayers of the saints. Selfish or intercessory? 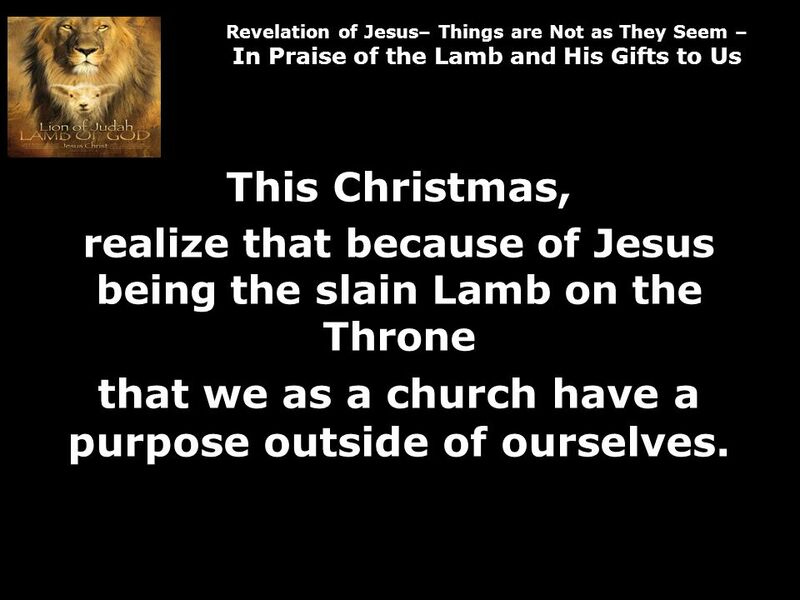 19 Revelation of Jesus– Things are Not as They Seem – In Praise of the Lamb and His Gifts to Us This Christmas, realize that because of Jesus being the slain Lamb on the Throne that we as a church have a purpose outside of ourselves. 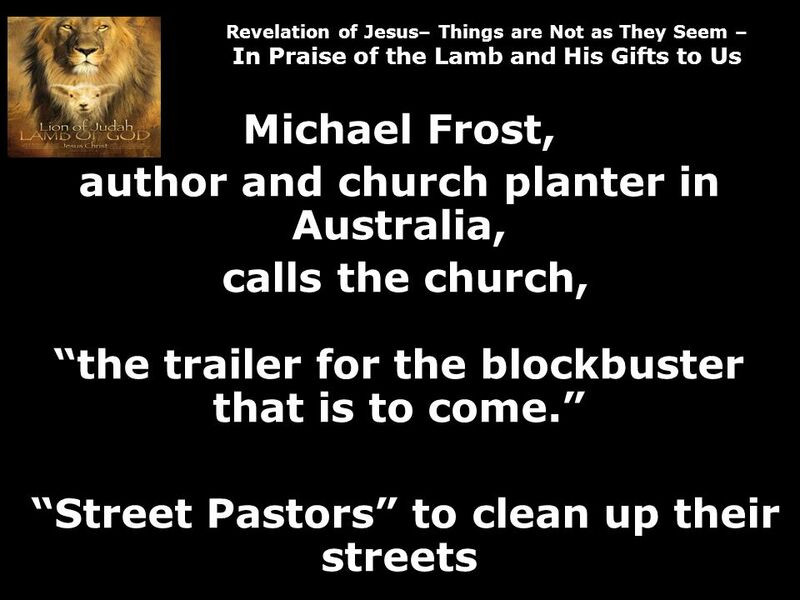 20 Revelation of Jesus– Things are Not as They Seem – In Praise of the Lamb and His Gifts to Us 3. Reign with Christ "You are worthy to take the scroll and to open its seals, because you were slain, and with your blood you purchased men for God from every tribe and language and people and nation. You have made them to be a kingdom and priests to serve our God, and they will reign on the earth." 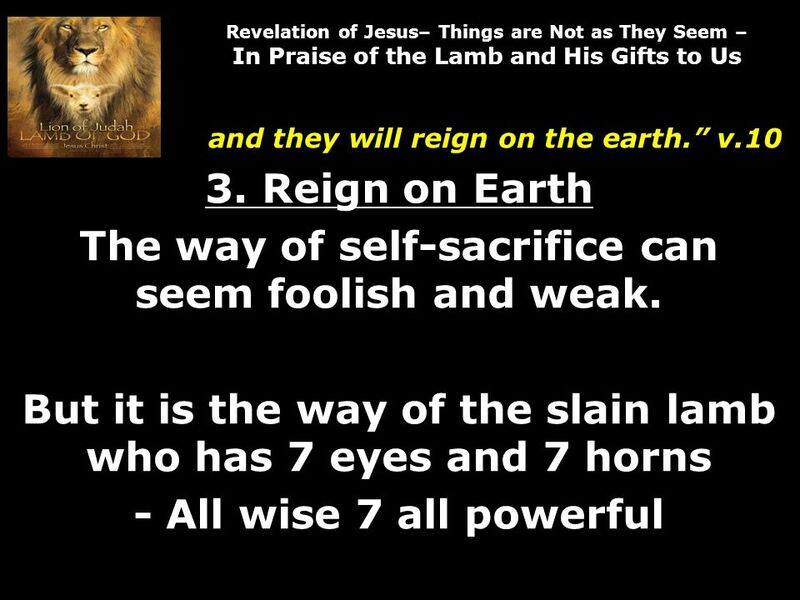 21 Revelation of Jesus– Things are Not as They Seem – In Praise of the Lamb and His Gifts to Us and they will reign on the earth. v.10 3. Reign on Earth Often only seen as a future aspect of the gift. 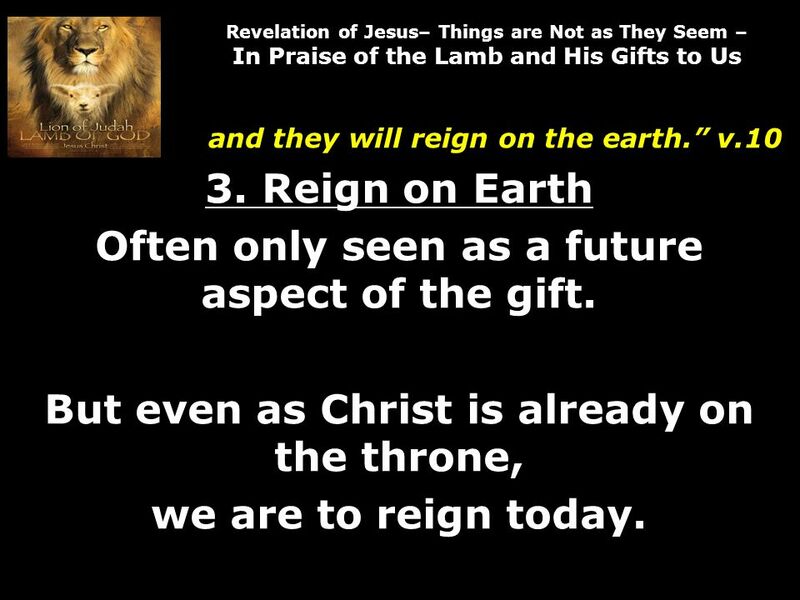 But even as Christ is already on the throne, we are to reign today. 23 Revelation of Jesus– Things are Not as They Seem – In Praise of the Lamb and His Gifts to Us and they will reign on the earth. v.10 3. Reign on Earth How do we reign? How did Jesus reign? Did he reign like a lion? Did Jesus reign like a slain lamb? 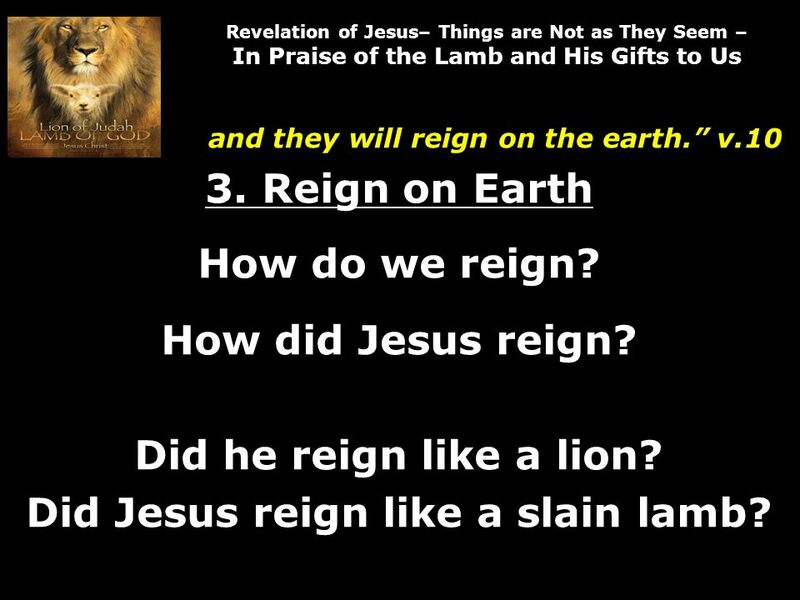 24 Revelation of Jesus– Things are Not as They Seem – In Praise of the Lamb and His Gifts to Us and they will reign on the earth. v.10 3. 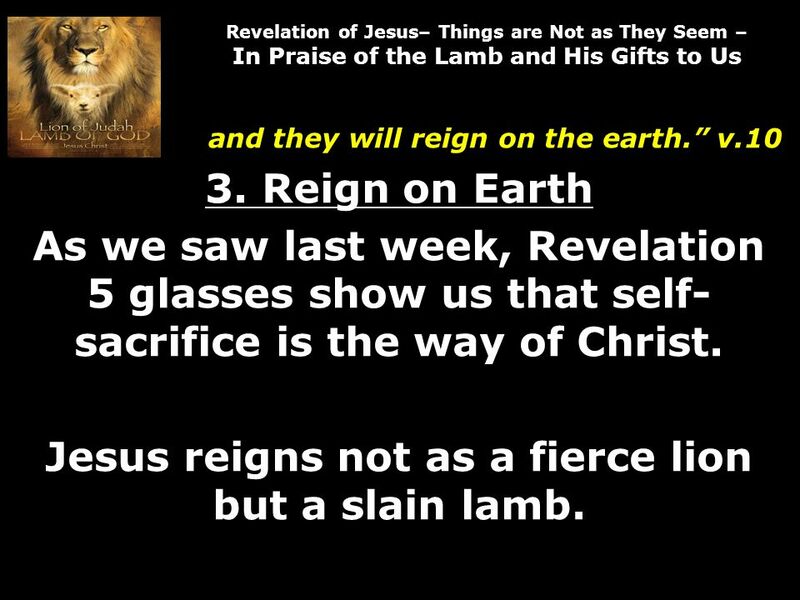 Reign on Earth As we saw last week, Revelation 5 glasses show us that self- sacrifice is the way of Christ. 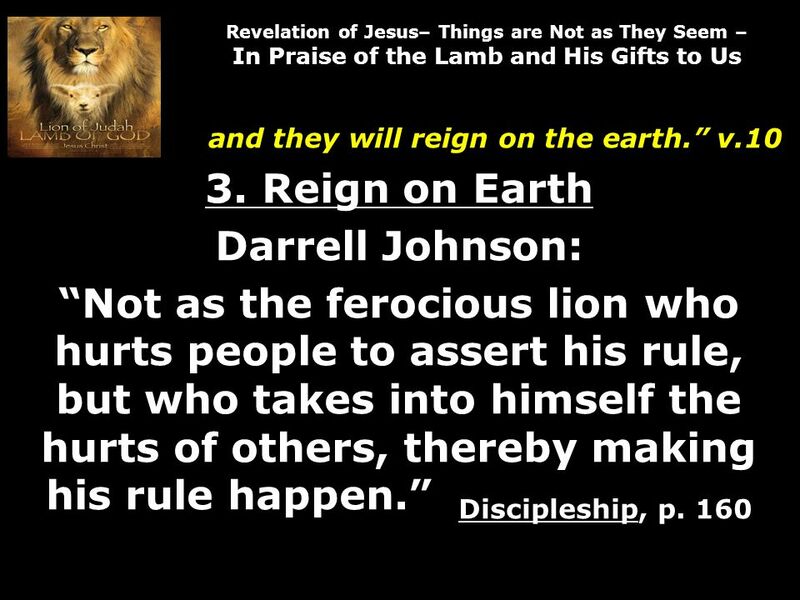 Jesus reigns not as a fierce lion but a slain lamb. 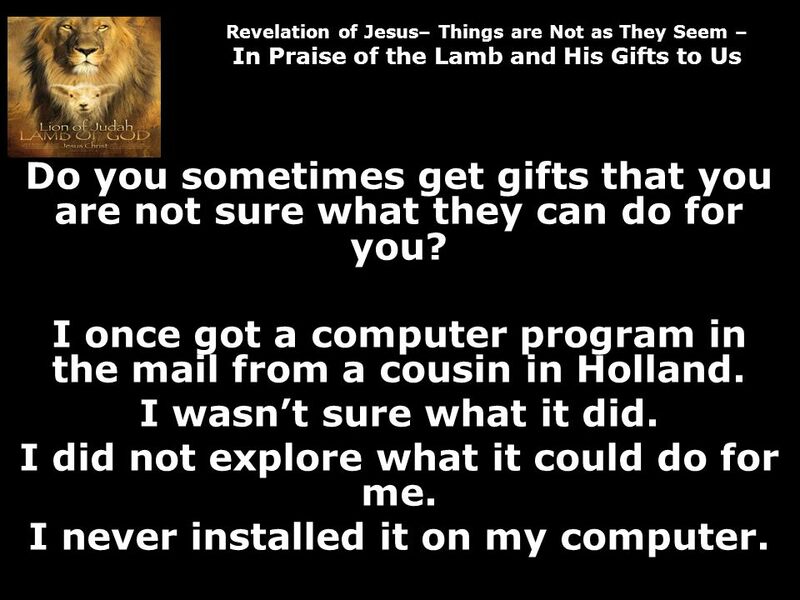 28 Revelation of Jesus– Things are Not as They Seem – In Praise of the Lamb and His Gifts to Us Remember the gift I received – the computer program. 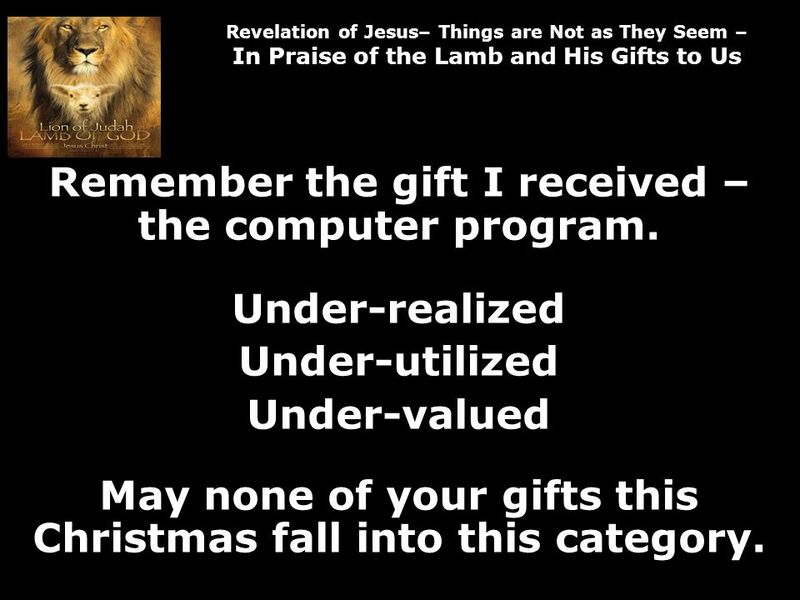 Under-realized Under-utilized Under-valued May none of your gifts this Christmas fall into this category. 29 Revelation of Jesus– Things are Not as They Seem – In Praise of the Lamb and His Gifts to Us This Christmas, with the benefit of Revelation 5 glasses, fully realize, fully use and fully be thankful for what Jesus has done for us: Setting us free from sin giving us a purpose and Allowing us to reign with Him through self-sacrifice. Download ppt "Revelation of Jesus– Things are Not as They Seem – In Praise of the Lamb and His Gifts to Us Scripture Reading Revelation 5 Text vv.9-10 This series of." Bringing your life together. Review Goal of this Series Developing active exhilarating faith experiencing God's intervention in our daily life. You can. TESTIMONY. Ephesians 2 Who am I? – Heavenly Perspective. Bible Study, 6/7/06 I Know my spiritual gift, now what? Pastor Erica. Key The Identification with Christ In his death In his resurrection In his ascension Romans 6:4-6 We were therefore buried with him through. Romans 6:16-18, 22 Jim Beasley Sunday, June 5, 2011. Revelation 12:7-11 And there was war in heaven, Michael and his angels waging war with the dragon. The dragon and his angels waged war, and they were. "Dignity of Causality" May 8, Making Your Life Count for the Kingdom Chinese Bible Church of Maryland English Sunday School Spring 2011. Jesus in the workplace Ephesians 6:5-9. God has a ‘big picture’ plan Ephesians 3:11...his eternal purpose which he accomplished in Christ Jesus our Lord. St. Philip Cedar Welcome and Celebrations. God’s Eternal Purpose By Grace Have You Been Saved through Faith. Eph. 2:1-10.